The view of the town Kallmünz and the medieval bridge. Photo by Alexis Tucker. GRAFENWOEHR, Germany — It’s not hard to fall in love with the town Kallmünz, located just over an hour from Grafenwoehr. The town’s colorful buildings and reflections cast on the water while crossing the medieval stone bridge are humbling. 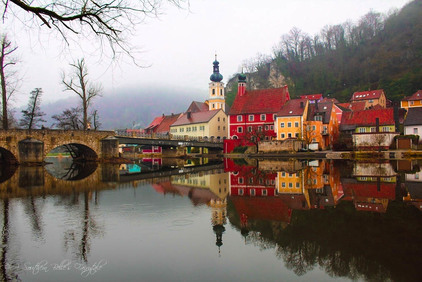 You would think that the Naab, the river that flows through the town, and the old cobblestone streets add the final touch to this charming town, but it is actually the swans that swim by and the castle that sits perched on the sleepy hill. Park your vehicle and walk the streets. You will pass multiple statues along the way that will peak your interest. This is largely due to the fact that the town is very popular for their artists, as you can also see when walking past the shops. Scenic sketches and paintings are on display for sale in the windows. If you have time to spare, check out the Laaber Castle ruins about 15 minutes away. Perhaps, my favorite thing about Kallmünz is walking around the town to view the variety of angles of the castle. The castle is the icing on the cake, especially since it’s free to visit. It will make for a romantic day and will be by far the most romantic town you will ever visit in Bavaria. The stroll through the dreamy town and the views from the top of the Kallmünz Castle alone is worthy. The earliest castle walls of the Kallmünz ruins were built in the 900’s but the castle itself was constructed in the mid-1300s. It was destroyed by fire in 1504 and was rebuilt during the Thirty Years War. Afterwards it was pillaged in the mid-1600s. Due to the condition of the castle, many areas have been blocked off due to safety hazards. But don’t let this stop you from getting amazing views. Not only is the castle rich in history, but so is the town. In 1713, the plague hit the nearby town of Regensburg, killing thousands of people. Unfortunately, it swiftly spread to the neighboring villages. The townspeople in Kallmünz were afraid and promised to build a chapel to honor St. Sebastian if they were spared from the plague. The plague passed by Kallmünz without touching the town, and in 1762 the St. Sebastian church was built. You can visit this church. Cross the bridge for the most amazing pictures of the church. Don’t miss the opportunity to visit this enchanting little town.